UPDATE: This giveaway is now closed, but we still have a few more in our 12 Days of Giveaways! Here at XOXOAD, we love doing something special to usher in the holidays, and this year, we’re celebrating with 12 Days of Giveaways! Enter each day for your chance to win a different prize pack of books perfect for any reader—and we hope you get everything you wished for. 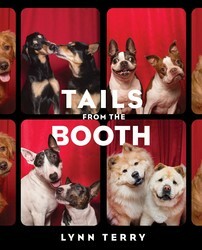 Our fourth day of giveaways is brought to you by Tails from the Booth author Lynn Terry! To enter, please comment answering the following question: Which of Lynn’s props do the pups tend to gravitate towards (and eventually destroy)? Keep reading to find the answer! If dogs could take selfies, it might look something like Tails from the Booth. These pictures show the countless ways dogs will ham it up in front of a camera, and that more dogs in a photo booth = even more fun! Although Mark Levin is known as a constitutional lawyer and a nationally syndicated broadcaster, he is, first and foremost, a dog lover. In 1998, he and his family welcomed a half-Border Collie/half-Cocker Spaniel they named Pepsi into their lives. 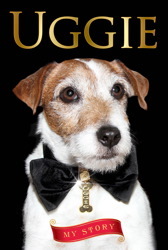 Six years later, his wife and son persuaded him to adopt a dog from the local shelter, a Spaniel mix. It turned out he was older than originally thought, and he was the most beautiful dog they'd ever seen. They named him Sprite. Their lives would never be the same. Sprite and Pepsi became fast friends. They did everything together, from rummaging through the trash to loudly greeting the deliveryman. And the Levin family fell in love with him -- with his gentle nature, beautiful face and soft, huggable fur. But on Halloween night, shortly after joining their family, Sprite suddenly collapsed and was rushed to the animal hospital. It was the first of many such visits, and the start of a long journey for the Levin family, filled with much joy and anguish. During the next two years, Sprite and Pepsi were inseparable. And Sprite's bond with the Levin family deepened. Friends, neighbors, and even Mark's radio audience came to know and love Sprite. As Mark's daughter turned eighteen and graduated from high school and Mark's son turned fifteen, Sprite's health deteriorated -- even as his spirits remained high and his beauty and grace continued to inspire. Between Thanksgiving and Christmas 2006, the Levin family said their emotional final goodbye. Crushed and consumed with grief, Mark turned to family, friends, and fans for help. But new hope came when the Levins least expected it. 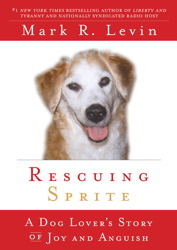 Rescuing Sprite is a stunningly intimate look at the love between a family and a dog, one that movingly shows, in Mark Levin's words, that "in the end, we humans are the lucky ones." 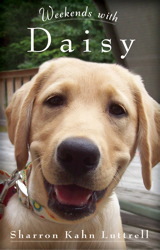 The author will donate a portion of his proceeds from the sale of this book to animal shelters. We decorite the house,best of all the Nativity scene. We always wish a MERRY CHRISTMAS to everyone! Which of Lynn’s props do the pups tend to gravitate towards (and eventually destroy)? The dogs quickly find her pinecone props and generally destroy them. Peanut butter is always a good thing! The dogs usually find & destroy the pinecone props. What a great contest! Lynn Terry is the best Pet Photographer hands down. She is patient and genius when capturing the best shots. The Photo Booth book is out of this world. the pinecone props. My puppy loves pine cones, too. They destroy the pinecone props. But the pictures are wonderful! The adorable dogs gravitate towards the pinecone props and eventually destroy them. And a constant vigil for the white snow prop to insure it doesn’t turn yellow! I sure hope each of these adorable dogs and cats get a nice, loving and warm home for Christmas! Pine cone props are a dog’s best chew toy for Lynn’s photo shoots. However, at least they work for dog treats. Happy Holidays. Oh those poor pinecone props! Also, I must say, I am a cat person through and through, but I’ve known some amazing dogs in my life too and these books look great! The pups wreck the pinecone props! The pups love the pinecone props. Pinecones! My dogs love these as well. The pinecone props! And my husband and I do the same thing with our cats – every year we take them to go see “Santa Paws” at Petco to their photo taken! We get an adorable holiday photo, and the proceeds go to help other animals! Happy Holidays! Oh the pinecones get destroyed bey the pups. The pinecone props, that they eventually destroy. The pine cone props. My Irish Setter would probably like them too.